RESEARCH » New Studies » Is China Systematically Buying Up German Key Technologies? Study DE: Kauft China systematisch Schlüsseltechnologien auf? Foreign direct investment (FDI) can have positive effects, such as job creation, on the host country’s economy. However, the surge in Chinese M&A transactions in Germany has recently aroused suspicion. What is behind the increased interest in "Made in Germany"? And in which sectors do investors from China invest most frequently? DOWNLOAD: Study DE: Kauft China systematisch Schlüsseltechnologien auf? DOWNLOAD: Study EN: Is China Systematically Buying Up Key Technologies? Foreign direct investment (FDI) can have positive effects, such as job creation, on the host country’s economy. Many countries therefore welcome FDI. However, the surge in Chinese M&A transactions in Germany has recently aroused suspicion. What is behind the increased interest in “Made in Germany”? And in which sectors do investors from China invest most frequently? 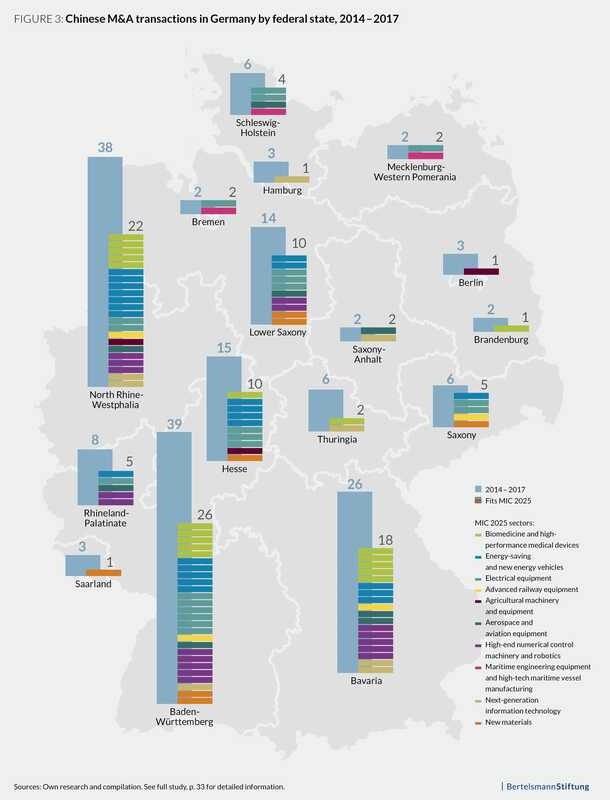 Our recent study sheds some light on Chinese companies’ activities in Germany in recent years. Daimler, Kuka or Deutsche Bank – the list of acquisitions by Chinese investors in Germany has become long over the past four years. In connection with this increasing interest, there is also growing concern in Germany that China is systematically buying up German key technologies in order to promote its own development. Our study examines 175 Chinese M&A transactions in Germany with a share of 10 percent, which is the customary threshold for FDI, or more for the period 2014 – 2017. Our analysis shows that 112 and thus almost two thirds of these investments (64 percent) take place in the 10 key sectors in which China aims to achieve a globally leading role by 2025. These include, for example, cars with alternative driving technology, biomedicine and robotics. These sectors are defined in the industrial policy strategy “Made in China 2025” (MIC 2025) announced by the Chinese government in 2015. The aim of the strategy is to turn China into one of the world’s leading industrial and technological locations. Our study also shows that a clear focus of Chinese M&A transactions is on the MIC 2025 sectors “Energy-saving and new energy vehicles ” (21 percent of the 112 investments fitting MIC 2025), “Electrical equipment” (19 percent), “Biomedicine and high-performance medical devices” (16 percent) and “High-end numerical control machinery and robotics” (15 percent). In these sectors, Germany to some extent has a strong technology edge. Therefore, they are attractive to foreign investors in general. It is not surprising that even before the MIC 2025 strategy, Chinese investors conducted M&A transactions in these sectors. However, it is striking that, since 2015, key sectors that are explicitly mentioned in the MIC 2025 strategy and previously played only a subordinate role have also gained in importance. This is particularly evident in the area of “Biomedicine and high-performance medical devices”. According to our research, there have been a total of 18 M&A transactions since the strategy was announced, whereas this area had previously played a negligible role. 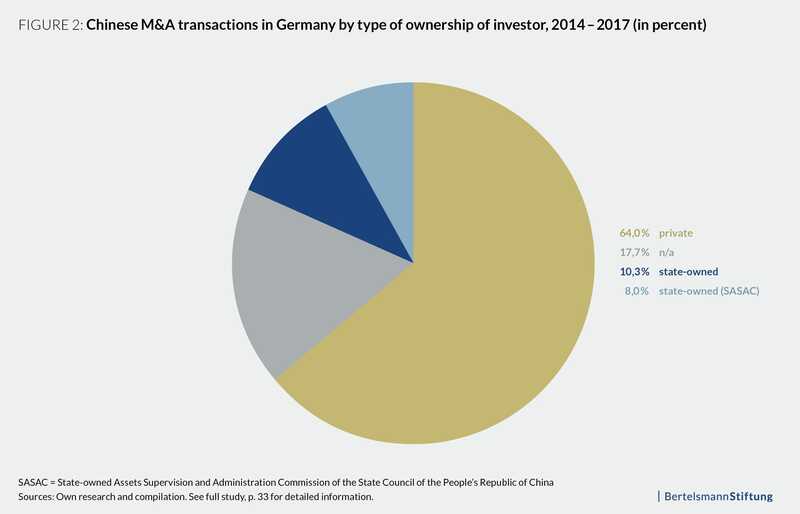 Our analysis shows that Chinese investors who are formally state-owned are in the minority when it comes to Chinese M&A transactions in Germany. Of the 175 M&A transactions surveyed, only 18 percent are attributable to state-owned investors. However, if only the 112 transactions fitting the MIC 2025 sectors are taken into account, their share rises to around 22 percent. This is a possible indication of the increased interest of state actors in acquiring specific know-how for the implementation of the MIC 2025 strategy abroad. 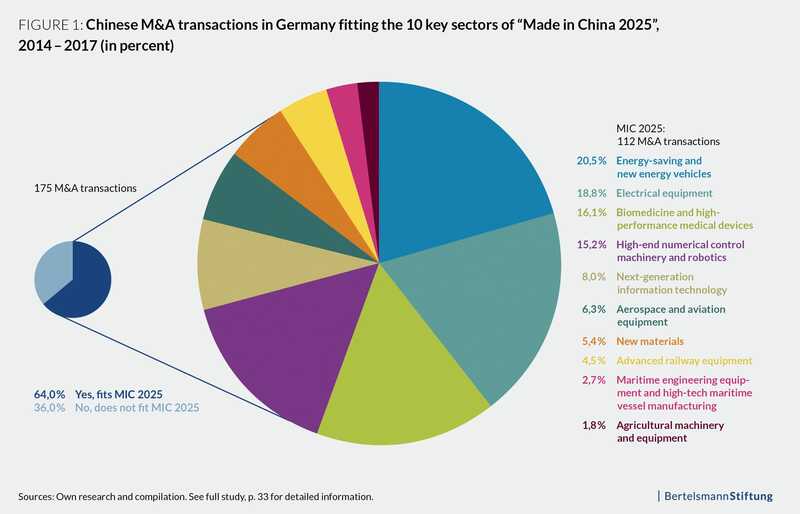 The majority of Chinese M&A transactions fitting MIC 2025 (59 percent) are spread across only three federal states: Baden-Württemberg (23 percent), North Rhine-Westphalia (20 percent), and Bavaria (16 percent). These are precisely the regions in which the majority of the so-called “hidden champions”, i.e. technological world market leaders, are located in Germany. For Germany and the EU, it is important to take a prudent approach to future investments from China: Currently, the fear of technological sell-offs dominates the public debate. But foreign direct investment usually brings in fresh capital and creates jobs in the host economy. In addition, Chinese investors have so far shown a long-term interest in their M&A targets and in some cases even issued location guarantees. At the same time, Germany and the EU should demand reciprocity and speak with one voice to economic powers such as China. Neither Germany nor the EU have anything to effectively counter China’s industrial policy strategy. If state influence distorts competition or discriminates against companies, Europeans should intervene with one voice. While the EU and Germany grant foreign investors free market access, China still deliberately protects key industries from foreign investors. Even 17 years after China’s accession to the World Trade Organization, there is no equal footing in mutual economic relations. An important step towards achieving more reciprocity would certainly be the conclusion of the bilateral investment agreement between the EU and China, which has been under negotiation since 2014. On the national level, Germany should give serious consideration to lowering the threshold for investment screening, which is applicable in security-relevant sectors such as critical infrastructure. Currently, the threshold is at 25 percent. It would make sense to lower it to ten percent, given that from this value economists usually start to speak of a foreign direct investment, with which the investor generally pursues the goal of obtaining lasting interest and control over the investment target. In addition, an EU framework for analyzing and screening M&A transactions from third countries – as is currently being discussed – would be useful: Such a regulation could perhaps prevent EU countries from being played off against each other and European standards in investment projects from being undermined. At present, only twelve of the 28 Member States have such a screening mechanism in place.